Juicy turkey burger sliders have a deep, meaty flavor from the Knorr® Intense Flavours Wild Mushroom Earth, and are topped with sweet sautéed onions. Combine the ground turkey, Knorr® Ultimate Intense Flavours Wild Mushroom, parsley, cumin, paprika, garlic and egg yolks in a large bowl. Sprinkle with salt and pepper and mix. Divide the turkey mixture into 24 equal portions using your hands, and shape into 24 small burgers about 9 cm wide. Griddle or grill the burgers until cooked through, about 3 minutes per side. Melt Gouda on each patty. Heat olive oil in a sauté pan. Cook the onions until soft and beginning to brown, about 15 minutes. Reserve. To build the burgers, spread Hellmann's® Real Mayonnaise on the top and bottom of each bun. Add a burger patty and top with onions and baby arugula. 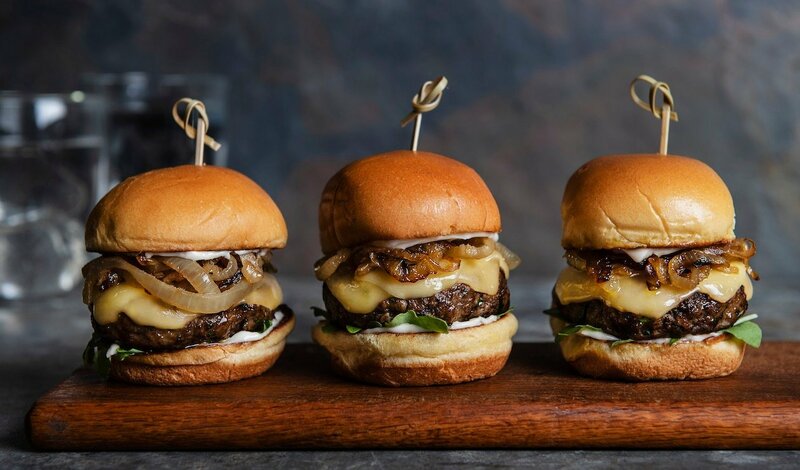 Serve 3 sliders per portion.